While technically competent, the value of United 93 will ultimately be gauged by the quality of the discussions it generates. The movie earns a recommendation solely in hopes of getting those discussions started. The events of September 11, 2001, were so cataclysmic everybody has a story about where they were when the World Trade Center and the Pentagon were attacked. I had just gotten back from two months in England and Ireland, a trip mixing business and pleasure that included both of U2’s Slane Castle shows. I arrived back home on Sunday, September 9, still craving one more pint of Guinness back in Dublin’s Temple Bar and still making my way back down to earth from the lofty elevation of those concerts. Monday, September 10, was a day to recuperate. Then, on Tuesday, September 11, I broke from my standard stateside workday routine and put on ESPN while I got ready for work. Normally I’d have The Today Show’s Katie Couric and Matt Lauer accompany me through my morning maintenance. As usual, I made my way to work listening to CDs and never switched over to the radio. When I pulled into the parking garage at work, a woman getting out of her car told me, “Nobody will be getting any work done today.” The World Trade Center was collapsing, she explained. It was news I had a very hard time digesting. In many respects, that day represented a shift in my ambitions and what I wanted out of life. During college, I spent more than a year at an internship in Connecticut and took the train down to Grand Central in Manhattan almost every weekend. New York City became my own private tropical island paradise, a place where anything was possible. My plan at the time was to work my way up the corporate ladder and snag prime office space somewhere toward the top of the World Trade Center. The aftermath of September 11 was a time of unfettered unity among Americans, when we all got back to basics and helped each other out. With all the airlines grounded, a friend of mine, a New Yorker stranded in California, had to make her way back across the country by train, arriving in Denver’s Union Station at 2 a.m., a few hours late. But I was there with a blanket, some candy, and some “soul food” (in this case that means some U2 bootlegs, since she’s also a Bonoholic). My point is this: September 11 was personal. For a lot of people. I visit New York every year and it still ticks me off that those towers, which served me — and countless others — as a compass when stepping out of subway stations, are no longer there and that thousands of innocent lives were taken with them. Going on 5 years later, the merits and motives of making movies based on the events of 9/11 are questionable. In addition to United 93, later this year Oliver Stone will release his own movie with an equally simple title, World Trade Center. In the case of United 93, it doesn’t tell the stories of the lives lost on September 11, 2001. It only tells how those lives were lost, based on the research of British filmmaker Paul Greengrass (Bloody Sunday). Starting off with the lead hijacker of flight 93 reading from the Koran and offering a Muslim prayer, the tension begins from the first frame. After that, however, the movie carries all the immediacy of a filmed transcript. Indeed, the movie supports no particular ideology and is essentially a sterile dramatization of some of the events on that horrible morning. Greengrass effectively captures the monotony of the airport waiting area, the mundane routines followed by ground personnel and airline crews getting a flight ready, and the quiet boredom of air travel. All of that is buffeted by the built in tension, since the outcome is so well known. However, Greengrass attempts to imbibe the movie with some real-time, real-life edge by constantly filming in a pseudo-documentary style. That can mean only one thing: perpetually jittery camerawork. It’s an overused device that ultimately makes this movie feel like one extremely long T.D. Waterhouse commercial. In some respects it’s disconcerting to think that people are being asked to — or would even want to — pay to see this movie. 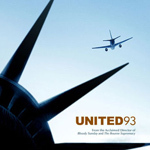 The movie’s official Web site includes a link to the Flight 93 Memorial Fund and the site seeks the cover of legitimacy with the words “Never Forget,” set as wallpaper in the typeface of an airline display screen. But true altruism would send all the proceeds from this production’s theatrical, cable, video, download, and all future media incarnations to the fund rather than allowing Universal Pictures to score a profit. Watching United 93 is a taut, uneasy experience and it certainly doesn’t provide any sense of comfort that we’re more secure as a nation today. While it purports to serve as a memorial to those lives lost, the movie lacks the obvious tribute: The end credits include an extremely lengthy “thank you” list, but those on board flight 93 are relegated to a generic, simple end-of-film dedication. More appropriately, each of the lives on all four of the hijacked planes and those who died in the World Trade Center should have been named individually, in tribute. Instead, the producers are careful to cover their legal bases by noting the film is — in part — a “work of fiction” and there’s also a disclaimer that disavows any affiliation with United Airlines. With its detached, matter-of-fact presentation of the events, United 93 doesn’t glorify the violence or provide a gung-ho American response. Even the now-historic words spoken by Todd Beamer, “Let’s roll,” are presented in a hushed fashion, without warranting an exclamation point, without the expected resurgence of the typical Hollywood patriotic film score. While Stone’s forthcoming movie will feature the star power of Nicolas Cage and Maria Bello, Greengrass wisely went with a cast of unknowns. Aside from the voiceovers of CNN news anchors, there are no recognizable names or faces to serve as a distraction. Notably, however, many people working at Herndon and in the various air traffic control centers play themselves, including Ben Sliney, the Federal Aviation Administration’s National Operations Manager. Ultimately, as Alfred Hitchcock would say, “It’s only a movie.” But that’s a bit too trite a dismissal. What this film offers is a reminder of what happened. In the words of another historic figure, George Santayana, “Those who cannot remember the past are condemned to repeat it.” If this film in any way sparks more people to refuse complacency and remain vigilant, then — and only then — could I deem this movie a complete success.